Nearly all Africa kontri presidents tanda for Beijing on Monday where China dash dem $60,000,000,000 to take do project but di question na why. 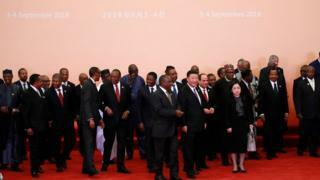 Chinese president Xi Jinping make di announcement for di beginning of di two-day Forum on China-Africa Cooperation. Di new $60 billion wey include $15 billion aid and loans wey dem no go pay interest amongst odas na part di goodies wey dey come out from dis padi padi forum. E no end dia, president Jinping also cancel di moni wey some of di poorer Africa kontris dey owe am. Tori be say for some time now, African kontris don dey rush to do business wit China wey for many pipo eye be di new world power. Merkel, May & Macron visit fit epp Nigeria? In fact, China don zoom past World Bank and di European commission as di single kontri wey dey fund infrastructure pass for Africa. According to Larry Madowo wey be di BBC Africa business editor, na say China na di single kontri wey dey fund infrastructure pass for Africa be di reason why Africa kontris except Swaziland rush go China for di China-Africa summit. Madowo tok say even though African kontris like to collect loans from China, some experts dey worry say di continent dey gada plenti debt. Cobus Van Staden wey be big oga for Witts University believe say "China dey invest for Africa to make money and na wetin Africa want too," but wia wahala dey na "if dem fit sustain am". Uganda for example, don collect $3bn Chinese loan wey dem use build train lines and infrastructure and China still even promise more. Even though fear dey say all dis projects and plenti money dey come from China, di kontri presido Xi Jinping don comeout tok say di money no be for "vanity projects" and dem no get plan to put hand inside Africa internal affairs. Im tok say di $60billion wey dem dey give Africa na China cooperation wit Africa and "dem dey target development and to create opportunities for young pipo." China sign 8 agreement to improve Ghana economy. Di agreement na to join hand togeda for aviation, nuclear energy, maternal and health project, plus sports and other tins for money wey pass $2 billion. President Muhammadu Buhari collect loan of $328 million from China to take improve di kontri telecommunication and IT infrastructure. Nigeria partnership wit China through di Forum on China-Africa Cooperation (FOCAC) don reach over $5 billion on to important infrastructure projects across di kontri country in side di last three years, Buhari tok. Dis one add to di plenti money Nigeria don collect on top railway projects since 2015. Presido Cyril Ramaphosa and some of im representatives sign agreement wit China to give dem economic growth and education opportunity for money wey pass $1 billion. For Presido Paul Biya, wetin dem want na make China reduce di way dem go pay back di $5 million (3 billion CFA) wey dem dey owe. 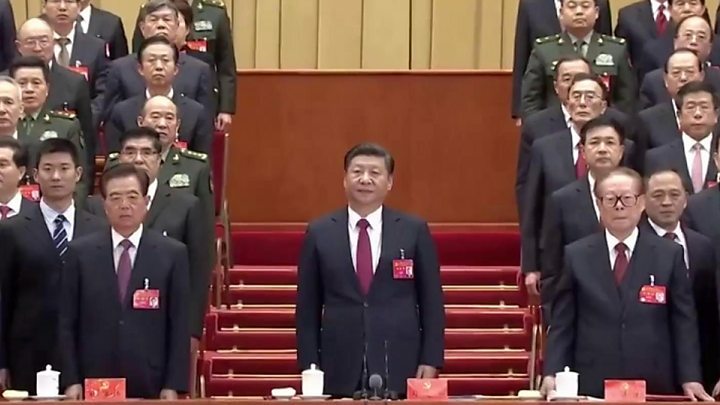 Wetin China leader Xi Jinping dey think?